Trinity University just called — they want to revoke my English degree for originally calling this a metaphor and not a simile. Oops. It’s a pretty poor similie, metaphorically speaking. I assume it’s a play on the cliche “poetry in motion”. Why is he attacking those poor kids, anyway? X-stacy (4): He’s time-traveling. The ginger kid will one day become the Riddler. The other one is Joel Schumacher. He’s trying to prevent the Batman Forever movie. 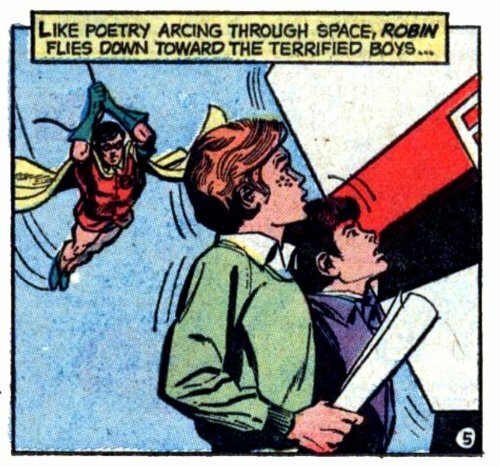 Sorry to tell you this Jeff, but NOTHING can be worse than Robin’s hot pants, except maybe Superman denouncing his American Citizenship. Renouncing, punkjay. And if you actually read the story (all three pages of it! ), Supes does it so the American govt doesn’t get blamed politically for things he does as a hero. While I find the story pretty pointless (like most short, guest-written stories that will never be referenced again) I really don’t think that story is as anti-American as some people seem to think it is. Especially considering that it’s immediately followed by a two-page spread of Superman waving a giant American flag. X-Stacy (7): I’ve read a review of the issue, but not the issue itself, but from what I’ve read, you’re right. The idea was not that Superman was taking an anti-American stance, but that he wanted to be seen more as Earth’s Superhero, not America’s. And in the end, he didn’t end up renouncing his citizenship anyway. Lets add some humor to punkjay’s (6) comment. Hey MM&I where the hell did u get that pic it’s hysterical! MMI (9): Hilarious! And nice to see it takes a fellow Canadian like Ryan Sohmer (I’m a big “Least I Could Do” fan) to satirize Superman like that. Yah, I’m rather fond of the “Least I Could Do” comic as well. punkjay (10) its a web comic that is updated every few +/-days. Is is actually a collaborative effort between numerous comic artists that make fun of comics. Certainly worth checking out. Here is a link to the comic. Here’s another good one punkjay. Damn you, MMI! I lost sleep reading the archives on The Gutters. Myro (17) at least you have a reason to have lost sleep. I just lost sleep because I’m a dumb a..
Well actually I was drawing the Celtic Pattern late last night and that’s why I lost sleep. Normally however its just because I’m an indiot and don’t go to bed early enough.